It's time to Fill the Cookie Jar! I missed out last month, and with the poor time management I have had lately, I am lucky to have made it this month! Our theme for the month is for Mother's Day, and a cookie that Mom likes. So, I asked my mom what she would consider her favorite cookie. Her answer, chocolate chip. I did a lot of thinking on what would make a special chocolate chip cookie, and I finally had it. The ever elusive, urban legend, Neiman Marcus Cookie. To any that remember the beginning of internet and email, you probably got the cookie email a bazillion times. It was as common as the email from Bill Gates telling you to forward your email and you would win ten thousand dollars. But, I knew they were both a hoax, and I deleted them and moved on, every time. I never actually considered that the cookie email might be a good recipe. But, over the years, I started hearing whispers and rumors about this recipe, and even though it was not a $200 recipe, it really did make a good batch of cookies! If you don't know the hoax, click here to read about it! There are many sites that have the Neiman Marcus Cookie Recipe online. That made me feel better about attempting this recipe, because if there is one thing that makes me sad, it is having a disappointing cookie! I did enough research that I felt good about making this for my mom's, Mothers Day Cookie. It is Amazing. Awesome. Perfect. Chocolately. I only changed two things. I cut the recipe in half. The original is way to big! And, the Hershey bar? I chopped it instead of grating it. In blender, add 2 1/2 cups oatmeal. Blend until it is a fine powder. Set aside. In large bowl, cream the butter and both sugars. Add eggs and vanilla, beat to combine. In another bowl, mix together flour, oatmeal, salt, baking powder, and soda. Add dry ingredients to butter mixture, mixing until all ingredients are completely combined. Add chocolate chips, and chopped Hershey bar, stirring again until chocolate is completely incorporated. Using small cookie scoop, drop dough onto cookie sheet two inches apart. Bake for 10 minutes at 375 degrees. Cool for 5 minutes on cookie sheet, then transfer to cooling rack. How interesting! These cookies look wonderful though. Chocolate chip cookies are my weakness! I have heard of these but never tried them. I am going to put them on my to-try list. I am going to age myself and say that I remember not only the beginning of having internet at home, but the Million Dollar Nieman Marcus cookie recipe too! I never made these, but I think I will have to now! 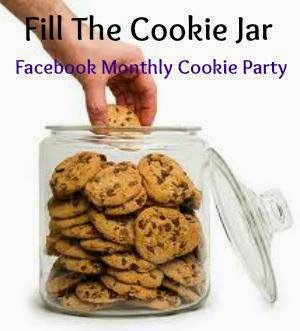 Glad you brought the to the Fill The Cookie Jar group! Yum. Thank you for sharing. I know two boys who will LOVE these. They look great! I have yet to make the Neiman Marcus cookie but thinking I need to make them after seeing your pics! I have made Neiman Marcus cookies and they are so good... These are prefect cookies for this months Fill the Cookie Jar. I love Urban Legend recipes like this. Who starts these things? ha ha. I have several versions of Mrs. Fields cookies. some good, some not so good. These look delicious and I think I will give them a try. who wants to waste time grating chocolate? i approve of your changes and think the cookies look marvelous. We don't live near Neiman Marcus anymore and I haven't eaten anything from them in a long time. These sound really good and I've pinned them to try. Would love if you came and shared this on Merry Monday Linky Party. Those sounds and look delicious. I think this would be a fun thing to do, I love cookies!